Mophie’s back with another Juice Pack, this time meant to both charge and ensconce your iPhone 4, while simultaneously protecting it from drops and guarding the antenna from finger-induced signal attenuation. Only a smidgen thicker than the Juice Pack Air — one millimeter, to be exact — the Juice Pack Plus actually packs a 33% higher capacity battery than its predecessor, all in a similar design with a colorful bumper-esque aesthetic and four LED lights that indicate the Juice Pack’s remaining charge. The Juice Pack Plus’ battery is rated at 2,000mAh, which is enough for 8 additional hours of talktime and 7 additional hours of 3G connectivity. 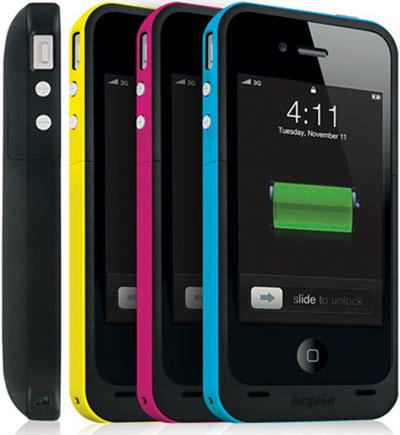 Colors include black, crayon, magenta and yellow; like its predecessor, the Juice Pack Plus charges through a micro-USB cable which passes through to your iPhone 4’s dock connector for syncing and charging. It looks like a solid update, but that update comes at a price: the Mophie Juice Pack Plus will cost you $99.95, or $20 over the Air.